امروزه اعتقاد بر این است که بُعد اجتماعی و مؤلفه‌های نهادی توسعه پایدار اهمیت خاصی در فرآیند رشد اقتصادی دارند؛ اما باید توجه کرد که تأثیر آن بر رشد اقتصاد غیرمستقیم است. این اثرگذاری از طریق کانال‌هایی انجام می‏گیرد که یکی از این کانال‏ها، تأثیر مستقیم سرمایه اجتماعی بر توسعه مالی است. بر این اساس هدف این تحقیق آن است که یکی از موانع توسعه بازارهای مالی در اقتصاد ایران بیشتر مورد بررسی قرار گیرد. تجزیه و تحلیل داده‌ها توسط مدل‌های آماری و اقتصادسنجی و آزمون فرضیه‌ها توسط روش خودرگرسیون با وقفه‌های توزیعی (ARDL) انجام گرفت. یافته‏های تحقیق بیانگر آن است که شاخص اختلاس و ارتشاء و جعل در کوتاه‏مدت و بلندمدت بر روی نسبت مطالبات سیستم بانکی از بخش خصوصی به کل مطالبات سیستم بانکی اثر منفی دارد. از سوی دیگر، شاخص چک‏های برگشتی بر شاخص چندبُعدی سرمایه اجتماعی در کوتاه‏مدت و بلندمدت اثر منفی بر نسبت دارایی‏های بانک‏های تجاری به دارایی‏های سیستم بانکی و بانک می‏گذارد. It is believed that social aspects and institutional components of sustainable development, have a great importance in economic growth process, but it should be considered that this effect on economic growth is indirect. This effect is done through some channels; one of these channels is the direct effect of social capital on financial development. Therefore, the purpose of this study is to investigate mostly one of the obstacles of financial markets development in Iranian Economy. The analyses are done by statistical models, econometrics and hypothesis tests by ARDL approach. The findings indicate that the index of embezzlement, bribery and forging have negative effects on the ratio of credit allocated to private enterprises to total domestic credit in short and long-run. On the other hand, the index of cheque default has a negative effect on the multilateral index of social capital on the ratio of commercial banks domestic assets to the banking system assets. ابوترابی، محمدعلی؛ «بررسی روند شاخص‌های توسعه مالی و رابطه علّی آن با رشد اقتصادی در ایران طی سال‌های 1352-1384»، پایان‌نامه کارشناسی ارشد به راهنمایی مصطفی سلیمی‌فر و محمدجواد رزمی، دانشگاه فردوسی مشهد، 1388. سامتی، مرتضی و شهنازی، روح‌الله و دهقان شبانی، زهرا؛ (1385)،«بررسی اثر آزادی اقتصادی بر فساد مالی»، فصلنامه پژوهش‏های اقتصادی ایران، سال هشتم، 1385، شماره 28. سعادت، رحمان؛ «برآورد روند سرمایه اجتماعی در ایران (با استفاده از روش فازی)»، فصلنامه تحقیقات اقتصادی، 1387، شماره 83. شریفیان ثانی، مریم و ملکی سعیدآبادی، امیر؛ «سرمایه اجتماعی به مثابه یک سیستم پیچیده»، فصلنامه پژوهشی رفاه اجتماعی، سال ششم، 1385، شماره 23. صمدی، علی‌حسین؛ «سرمایه اجتماعی و توسعه مالی: اقتصاد ایران (1350-1385)»، فصلنامه تحقیقات اقتصادی، 1388، شماره 44. دادگر، یدالله و نظری، روح‌الله؛ «ارزیابی شاخص‌های توسعه مالی در ایران»، کنفرانس بین‌المللی توسعه نظام تأمین مالی، 1388. رحمانی، تیمور؛ عباسی‌نژاد، حسین و امیری، میثم؛ «بررسی تأثیر سرمایه اجتماعی بر رشد اقتصادی ایران مطالعه موردی: استان‏های کشور با روش اقتصادسنجی فضایی»، فصلنامه پژوهش‏های اقتصادی، سال ششم، 1386، شماره 2. 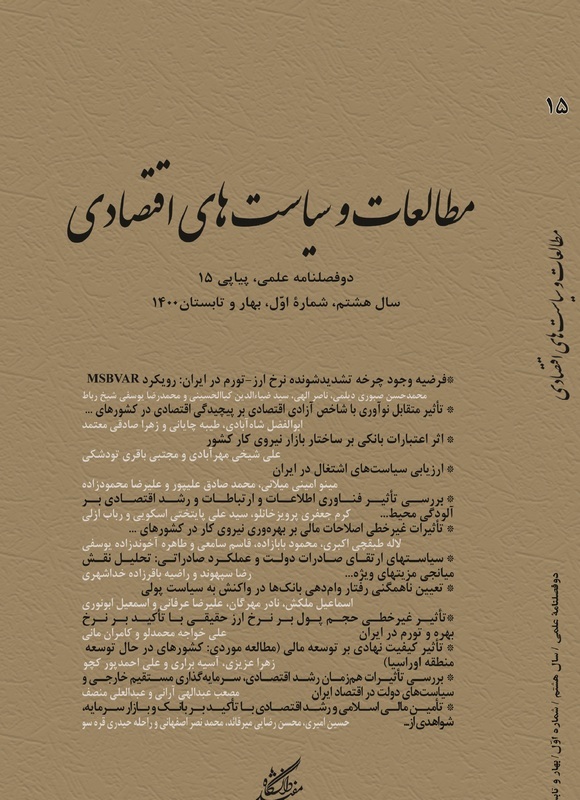 سوری، علی؛ «سرمایه اجتماعی و عملکرد اقتصادی»، فصلنامه تحقیقات اقتصادی، 1384، شماره 69. علمی ، زهرا؛ شارع پور، محمود و حسینی امیر حسین؛ «سرمایه اجتماعی و چگونگی تأثیر آن بر اقتصاد»، فصلنامه تحقیقات اقتصادی، 1383، شماره 71. فرانکوئیس، پاتریک؛ سرمایه اجتماعی و توسعه اقتصادی، ترجمه: محسن رنانی و رزیتا مؤیدفر (1386)، معاونت برنامه‏ریزی و نظارت راهبردی ریاست جمهوری، تهران، 1386. فوکویاما، فرانسیس؛ پایان نظم (سرمایه اجتماعی و حفظ آن)، ترجمه غلام‌عباس توسلی، تهران، انتشارات جامعه ایرانیان، چاپ اول، 1379. نظیفی، فاطمه؛ «توسعه مالی و رشد اقتصادی در ایران»، فصلنامه پژوهش‌های اقتصادی، 1383، شماره 14. Aboutorabi, M. A. and Aboutorabi, N; 2012, Financial Development and Economic Growth in Iran: The Survey of the Trend of Financial Development Indicators and its Causality Relationship with Economic Growth in Iran, Lambert Academic Publishing (LAP): Saarbrücken/ Germany. Aldrich, H. E., Cliff, J. E; 2003, "The Pervasive Effects of Family on Entrepreneurship: Toward a Family Embeddedness Perspective", Journal of Business Venturing, 18: 573-596. Anderson, R. C., Mansi, S. A., Reeb, D. M; 2003, "Founding Family Ownership and the Agency Cost of Debt", Journal of Financial Economics, 68: 263-285. Angbazo, L; 1997, "Commercial Bank Net Interest Margins", Default Risk, Interest Rate Risk and Off-Balance Sheet Banking, Journal of Banking and Finance, 21: 55-87. Arregle, J. L., Hitt, M. A., Sirmon, D. G., Very, P; 2007, "The Development of Organizational Social Capital: Attributes of Family Firms", Journal of Management Studies, 44: 72-95. Arrow, K; 1972, "Gifts and Exchanges", Philosophy and Public Affairs, 1(4): 343-362. Bates, T; 1997, "Financing Small Business Creation: the Case of Chinese and Korean Immigrant Entrepreneurs", Journal of Business Venturing, 12: 109-124. Batjargal, B; 2003, "Social Capital and Entrepreneurial Performance in Russia: A longitudinal study", Organization Studies, 24(3): 535-556. Birley, S; 1985, "The Role of Networks in the Entrepreneurial Process", Journal of Business Venturing, 1(1): 107-117. Bosse, D. A; 2009, "Bundling Governance Mechanisms to Efficiently Organize Small Firm Loans", Journal of Business Venturing, 24: 183-195. Bottazzi, L., Da Rin, M., Hellmann, T. F; 2011, "The Importance of Trust for Investment, Evidence from Venture Capital", NBER Working Paper, No. 16923, Cambridge, MA. Bourdieu, P; 1986, The Forms of Capital, Handbook of Theory and Research for the Sociology of Education, Greenwood: New York, pp. 241-258. Calderon, C. A., Chong, A., and Galindo, A. J; 2002, "Development and Efficiency of the Financial Sector and Links with Trust: Cross-Country Evidence? ", Economic Development and Cultural Change, 51(1): 189-204. Cassar, G; 2004, "The Financing of Business Start-ups", Journal of Business Venturing, 19(2): 261-283. Chang, E. P. C., Chrisman, J. J., Chua, J. H., Kellermanns, F. W; 2008, Regional Economy as a Determinant of the Prevalence of Family Firms in the United States: A Preliminary Report, Entrepreneurship Theory and Practice, 32: 559-573. Chou, Y. K; 2006, "Three Simple Models of Social Capital and Economic Growth", Journal of Socio-Economics, 35: 889-912. Chua, J. H., Chrisman, J. J., Kellermanns, F. W., Wu, Z; 2011, "Family Involvement and New Venture Debt Financing", Journal of Business Venturing, 26(4): 472-488. Coleman, J; 1988, "Social Capital in the Creation of Human Capital", American Journal of Sociology, 94: S95-S120. Coleman, J; 1990, Equality and Achievement in Education, West views Press: Boulder. El-Attar, M. and Poschke, M; 2010, Trust and the Choice Between Housing and Financial Assets: Evidence from Spanish Households, IZA Discussion Paper No. 5246. Evans, D., and Jovanonic, B; 1989, "An Estimated Model of Entrepreneurial Choice under Liquidity Constraints", Journal of Political Economy, 97: 808-827. Gomez, R. and Santor, E; 2001, "Membership Has Its Privileges: The Effect of Social Capital and Neighbourhood Characteristicson the Earnings of Microfinance Borrowers", The Canadian Journal of Economics, 34(4): 943-966. Graham, J; 2000, "How Big Are the Tax Benefits of Debt? ", Journal of Finance, 55(5): 1901-1941. Granovetter, M. S; 1985, "Economic Action and Social Structure: The Problem of Embeddedness", American Journal of Sociology, 91(3): 481-510. Guiso, L., Sapienza, P., and Zingales, L; 2004, "The Role of Social Capital in Financial Development", The American Economic Review, 94(3): 526-556. Harris, R. and Sollis, R; 2003, Applied Time Series Modeling and Forecasting, Wiley: West Sussex. Herzing, Christian and Moon, Jeremy; "Discourses on corporate social ir/responsibility in the financial sector", Journal of Business Research, 66(10): 1870-1880. Holtz-Eakin, D., Joulfaian, D., Rosen, H; 1994, "Entrepreneurial Decisions and Liquidity Constraints", Rand Journal of Economics, 25: 334-347. Inder, B; 1993, "Estimating Long-Run Relationships in Economics: A Comparison of Different Approaches", Journal of Econometrics, 57: 53-68. Marsden, P. and Hurlbert, J; 1988, "Social Resources and Mobility Outcomes: A Replication and Extension", Social Forces, 67: 1038-1059. Morduch, J; 1999, "The Microfinance Promise", Journal of Economic Literature, 37: 1569-14. Pearson, K; 1901, "On Lines and Plans of Closest Fit to System of Points in Space", Philosophical Magazine, 2(6): 559-572. Pesaran, M. H. and Pesaran, B; 1997, Working with Microfit 4.0: Interactive Economteric Analysis, Oxford University Press: London. Pesaran, M. H., Shin, Y. and Smith, R; 2001, "Bound Testing Approaches to the Analysis of Level Relationships", Journal of Applied Econometrics, 16: 289-326. Petersen, M. A., and Rajan, R; 1994, "The Benefits of Lending Relationships: Evidence from Small Business Data", Journal of Finance, 49: 3-37. Shahinpoor, N; 2009, "The Link between Islamic Banking and Microfinancing", International Journal of Social Economics, 36(10): 996-1007. Smith Jr., C., and Warner, J. B; 1979, "On Financial Contracting: An Analysis of Bond Covenants", Journal of Financial Economics, 7: 117-161. Spagnolo, G; 1999, "Social Relations and Cooperation in Organizations", Journal of Economic Behavior and Organization, 38(1): 1-25. Organizations, In: March, J.G., March, J.G. (Eds. ), Handbook of Organizations, Rand McNally & Company: Chicago, pp. 142-193. Townsend, R; 1979, "Optimal Contracts and Competitive Markets with Costly State Verification", Journal of Economic Theory, 21: 265-293. Tsai, W. and Ghoshal, S; 1998, "Social Capital and Value Creation: The Role of Intrafirm Networks", Academy Management Journal, 41(4): 464-476. Ueda, M; 2004, "Banks versus Venture Capital: Project Evaluation, Screening, and Expropriation", Journal of Finance, 59: 6001-6621. Uzzi, B; 1999, "Embeddedness in the Making of Financial Capital: How Social Relations and Networks Benefit Firms Seeking Finance", American Sociological Review, 64: 481-505. Van Bastelaer, T; 1999, "Imperfect information, social capital and the poor’s access to credit", Working Paper No. 234, Center for Institutional Reform and the Informal Sector (IRIS), University of Maryland. Wong, K. P; 1997, "On the Determinants of Bank Interest Margins under Credit and Interest Rate Risks", Journal of Banking and Finance, 21: 251-271. World Economic Forum, Davos; 2010, Financial Development Report, USA Inc: New York, USA. Wu, Mengg-Wen and Shen, Chung-Hua; 2013, "Corporate social responsibility in the banking industry: Motives and financial performance", Journal of Banking and Finance, 37: 3529-3547.